The deep dish features a bold design of a long stem plant (maybe the tip of a hollyhock?) over the top segment of a larger leaf set against a ground of stylised plum blossoms and tiny, irregular grain pattern. The brilliant green enamel of the plants, applied very thickly to create a light relief, contrasts beautifully with the vibrant yellow overglaze enamel that is used to cover the centre of the dish’s interior as well as the high border. The floral motifs are outlined with thin, black lines, while underglaze iron oxide is used as a demarcation line between the central circle and the rim, as well as for the geometric line patterns around the border. The raised rim is glazed in iron oxide. 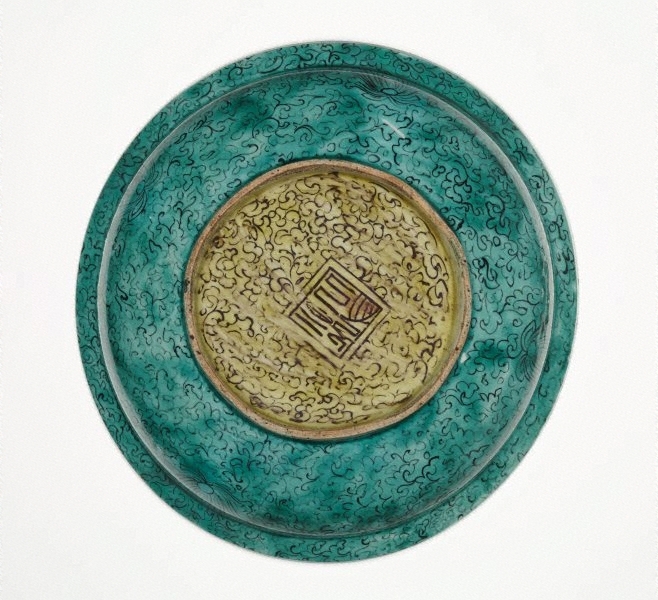 The exterior of the dish has a design of stylized peonies and clouds entirely covered in overglaze green enamel, while the centre of the base is painted in yellow enamel and decorated with stylized cloud pattern. It bears a mark of a square double frame with a Chinese character written in the seal script that could be read ‘fuku’ (good fortune). 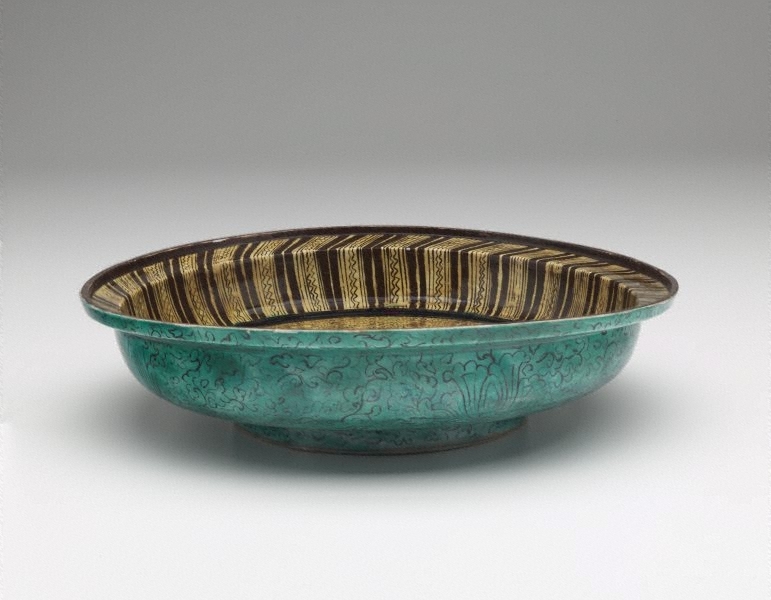 The dish belongs to the Aode (green) type of Kokutani porcelains, arguably one of the most visually fascinating and enigmatic groups of Japanese enamel wares from the early Edo period (1615-1868). Up to the early 20th century, it was believed that Kokutani (meaning ‘Old Kutani’, to distinguish this group from 19th century wares from the Kutani kilns in Ishikawa Prefecture) wares were produced in the village of Kutani for the use of the Maeda family, lords of the Kaga Province (today Ishikawa Prefecture). However, archaeological excavations from the 1990s have yielded firm evidence that the wares hitherto identified as Kokutani, characterised by the use of rich, dark colours and bold, eccentric designs, were manufactured at the Yanbeta kilns in the Arita region during a relatively short period between 1640s and 1660s. 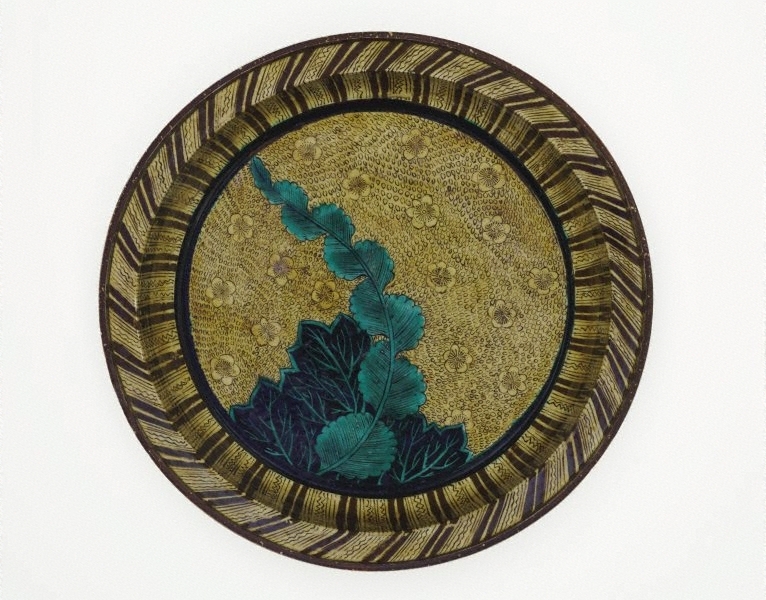 While most Kokutani wares display landscape and other floral motifs painted in blue, green, yellow, purple and touches of red enamels on an uncoloured, white background, the surface of the Aode Kokutani vessels are covered entirely with saturated green and yellow enamels – hence the name ‘Aode’ ( meaning green) – that almost obscure the main design. Compared to other Kokutani porcelains, whose motifs display a strong Chinese influence, Aode wares, produced mainly in the 1650s to 1660s, show more dynamic, sensuous designs that took their inspiration from Japanese painting of the Kano school. In fact, it has been suggested that the Aode style is an allusion to screen painting, with the green enamel referring to the malachite pigment and the yellow to the gold leaf used to cover the screens’ background. The fascination of 17th century Aode wares lies not only in their exotic designs and exuberant colours, but above all in their uniqueness, in that no two pieces are the same. The painters seemed to rely more on their imaginative power than on prevalent model books.